Prefinished (also spelled pre-finished) hardwood flooring takes the muss and fuss out of installing hardwood floors. Depending on your situation, this can be your best option when choosing wood flooring. When choosing prefinished wood flooring, go with a solid or engineered hardwood floor and have a beautiful floor in as short a time as it takes to lay the boards. Take the hassle and mundane work out of finishing your hardwood flooring with prefinshed hardwood flooring. What is prefinished hardwood flooring? As the name suggests prefinished hardwood flooring is hardwood flooring that has been finished in a factory before being sold to retail outlets. When you buy unfinished hardwood flooring you are allowed to create any look you want, you can match the finish of already existing hardwood flooring, and you have a greater uniformity in finish because it’s sanded and sealed as one piece after installation. Prefinished hardwood flooring is available as engineered and solid hardwood flooring. These flooring products are purchased already finished and ready to install and use immediately. Engineered prefinished hardwood flooring is constructed in a fashion similar to that of common plywood with an actual hardwood veneer on the surface which is known as the wear layer. These wear layers can vary and the key to choosing quality prefinished hardwood flooring is to check the thickness of the wear layer. Many prefinished engineered hardwood flooring can also be refinished a number of times but this depends on the thickness of the wear layer. For those looking for a flawless finish, floors may need to be refinished every five years but it is worth noting that minor scratches and dents add character to hardwood flooring. Engineered prefinished flooring can be refinished at least two or three times. It is more stable and cheaper than solid prefinished hardwood flooring as there is minimal expansion and contraction in this product. Solid prefinished hardwood flooring is as the name suggests; solid hardwood that has been factory finished. Solid prefinished hardwood floors can be refinished as needed. When it comes to any hardwood flooring, the wood and finish you choose will determine the amount of refinishing that will be required in the future. Wood is rated for hardness using the Janka hardness test. Brazilian ebony has a Janka rating of 3692 and is the hardest wood on the market, while Brazilian fir has a Janka rating of 0060 and is the softest. Oak, which is the most common flooring types, has a Janka rating of 1260 for red and 1360 for white. The higher the Janka rating the harder the wood will be to damage. So if you combine a hard-wearing finish with a hard wood, you will have less refinishing of your floors. When it comes to installing hardwood flooring in your home, prefinished flooring will demand less time and energy. Unfinished flooring requires finishing on site and this can take on average up to a week of sanding and applying a polyurethane finish. Prefinished hardwood flooring has already been sanded and coated with polyurethane, so there is no health hazard involved as there is no dust or toxic fumes, and much of the off gassing has already happened. Finishing the wood in the factory also cuts down on labor costs during installation, making prefinished hardwood flooring more affordable. Another great advantage of prefinished hardwood flooring is of course, the manufacturers warranty on the finish; you don’t get this with unfinished hardwood flooring, though the installer may offer a warranty. Unfinished flooring does however have its advantages too. With unfinished flooring, although it takes longer to install, you have the advantage of creating a unique look, and it is easier to match the finish of your existing wood flooring. There is also better uniformity when finishing hardwood flooring yourself especially if a large room is being floored. When prefinished flooring is purchased for large rooms, it can be very hard to match all the flooring pieces as color and texture can vary. Aluminum oxide finishes are used quite frequently with prefinished floors and provide a tough finish. Note that no finish can withstand all wear and tear, so you have to care for any floor you install. High gloss finishes will show scratches and dust more than other finishes, especially on open grained hardwoods such as maple and oak, and on dark flooring materials such as ebony. Why vacate your home for a week while your hardwood flooring is being installed. With prefinished hardwood flooring you don’t need to. You can reduce your hassles and use your new floor quickly when you select prefinished hardwood flooring. 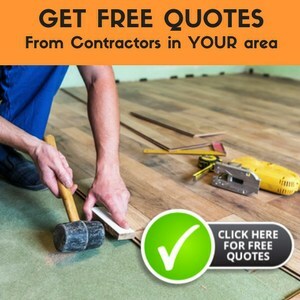 There are many manufacturers for prefinished flooring. Do your research first to see if this is what you really, really want. While the finishes are durable, many people complain about smudges, streaking, etc when cleaning and just aren’t happy with the finish in general. You must be careful how you clean them so that you don’t void the warranty. You will usually void the warranty if you decide you don’t like the finish and try to use some other finishing product over it (sealers, waxes). Yes, the bevels show. It’s not really a problem, but you do have to be a bit more diligent in removing dirt where the bevels are. You should call the manufacturer to see what type of finish your new flooring has. This is really important because you need to use the proper type of poly so that it won’t react with the finish that’s already on there. I started building a house in 2003. I done alll of the inside myself as well as installed all of the flooring. I went with one of the pre-finished engineering wood flooring products. The floor is beautiful. My question is this: Can I safely put a polyurethane finish on the floor? I want to put a thin coat just to fill in the cracks between the boards to make it even easier to keep clean. I have 2 young boys which is why I chose to goo with the wood flooring in the first place. It would be best to call the manufacturer and ask them if poly would adhere to the product or if you have some of the flooring left over, you could try it yourself. Keep in mind though, that if you do this you have voided your warranty. We just had some .75″ X 2.25″ Brazilian Cherry hardwood flooring installed in our living and dining room that we purchased at a builders wharehouse auction. The boxes stated “MB4”, UV Ceramic, Sheen 40%. What does this mean as far as any additional polyurethane we might was to add to protect against two dogs that sometime forget that “indoor plumbing” isn’t what they should be counting on on the cold, damp, rainy days when the dining room looks so much more inviting?.. I’ve seen where we shouldn’t add additional coats now, as there are already 7 coats on the pre-finished wood. thanks. Have you tried Stain Solver . I would give that a try! How exciting,Congratulations! I personally would use a microfiber dry mop and dust. I would then clean up anything left over with a damp mop using StainSolver. To finish the floor I would use a clean, dry microfiber cloth afterward too – sort of *buff* your floor with it. Enjoy your floor! we just installed brazilian cherry engineered wood in 2 rooms. In one room the finish is shiney and rich, in the the other room, the finish appears dull. We noticed quite a bit of adhesive residue on the “dull floored room” and observed the contractor slathering mineral spirit saturated clothes all over the floor to mop up the dried adhesive. We were wondering if this method of clean up could have resulted in dulling the surface. The mineral spirits could dull the floors. I would recommend calling the manufacturer of the flooring and ask them about them about using mineral spirits and the effects on that flooring. You made the comment above with regard to prefinished flooring: “…much of the off gassing has already happened.” My retailer claims that there is no off gassing with prefinished floors. Is there? Is one type of prefinish better than another, as far as off gassing goes? Thank you. Prefinished hardwood flooring has already been sanded and coated with polyurethane, so there is no health hazard involved as there is no dust or toxic fumes, and much of the off gassing has already happened. I do believe there is a limited amount of off-gassing that can occur with any treated product. However, as stated, the prefinished does not present a health hazard like the actual finishing process would. I am not familar with any of the brands being any better or worse than another.